Moisturizing creams serve to keep the skin feeling smooth, soft, looking radiant and healthy by retaining moisture or water in the outer most skin layer. 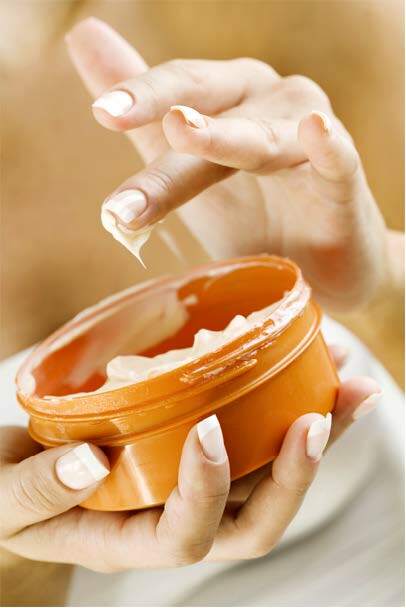 Different moisturizing creams will be defined by their viscosity or thickness. Formulating moisturizing creams therefore largely depends upon the required end product consistency influencing the choice of material to use. For instance, a lipid rich cream will have decreased spreadability values with an increase in viscosity and surface tension (a measure of cohesiveness), making the cream greasy, tacky and difficult to spread. The lower the viscosity of a cream, the lower the surface tension and the more the cream is easily spread and absorbed into the skin. The spreadability accessory quantifies the spreadability of samples. It consists of a set of matched male and female Perspex cones. Fill the four lower cones (female cones) with the sample using a spatula. Level the surface using a flat knife. Position the base table on the base of the machine. Loosely tighten the screws of the base table to enable a degree of mobility. Place the base holder on to the base table and lock into position with the screws. Insert the female cone into the female. cone sample holder. Attach the male cone to the Load cell. Precisely align the male and female cones by lowering the male cone and repositioning the female cone such that the male cone fits into the female cone. The screws of the base table can now be tightened. Prior to testing, the male probe must always be placed a few millimeters above the sample.Commence the test. Precise alignment of the probes is essential in order to avoid instrument overload. Fluctuations on a smooth curve are a result of the compression of air pockets. It is therefore important to minimize air pockets when filling the female cone. The base holder should not be removed from the base table between tests as this will necessitate realignment of the male and female probes. The female cone can be removed after the test by loosening the screws of the base holder. For comparison purposes, the test temperature must always be reported in the results. The following graph shows the spreadability of two different types of moisturizing cream. Figure I shows the spreadability of two types of moisturizing cream at 21°C using 45° male and female cone probes. For each test, the male cone was positioned 3 mm above the sample surface. Figure II is a load versus distance graph for the spreadability of two types moisturizing creams. When a trigger force of 10 g has been achieved, the probe proceeds to penetrate the sample at a test speed of 2 mm/s to a depth of 25 mm. During this time, the force to penetrate the sample increases. When the specified penetration distance has been reached, the probe withdraws from the sample at the post-test speed of 2 mm/s. The maximum force value on the graph is a measure of the firmness of the sample at the specified depth. The area under the positive curve is a measure of the energy required to deform the sample to the defined distance (Hardness Work Done). Research has shown that the firmness and energy required to deform a sample to a defined depth grades samples in order of spreadability. A higher peak load (firmness) and hardness work done value indicate a less spreadable sample. Conversely, a lower peak load (firmness) value coupled with a lower hardness work done value indicates a more spreadable sample. From Figure 1, Sample B is significantly much firmer than Sample A and has a higher hardness work done (area under the positive curve). This indicates that A is more spreadable than sample B.